and our pursuit of excellence and quality, we have developed an online catalog for you, our fellow enthusiasts. As Italian Car Enthusiasts ourselves, we know how hard it sometimes is to locate many of the items needed to maintain your Italian car. Many parts are rare and sometimes impossible to locate. That’s why Italian Car Parts was formed. While you visit with us, be sure to complete our Catalog Request. We will add your information to our very exclusive list of Italian Car Enthusiasts and send a complementary copy of our printed catalog for you to enjoy. We don't exchange or share our mailing list with other companies! 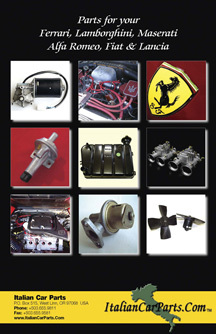 Copyright Italian Car Parts 2012. Not to be reproduced by any means. Other Trademarks and Copyrights property of their owners.